Culture.pl remembers the Polish art historians, architects and museum personnel who saved Europe’s cultural heritage during World War II. The stories of their lives sound like a plot ready-made for a Hollywood movie. So who were these people that managed to keep many of Poland’s national treasures from falling into Nazi German hands? Who were Poland’s ‘Monuments Men’? In the summer of 1939, almost all museums and art galleries in Europe were busy preparing for a great evacuation of precious artwork. Among them was St. Mary’s Basilica in Kraków, where the young art historian Karol Estreicher and a group of several dozen scholars, priests, and firefighters were hectically trying to disassemble and hide the monumental St. Mary’s Altar by Wit Stwosz. Dismantled into over 2,000 pieces and carefully wrapped in scrap paper, Kraków’s most precious masterpiece, which had not been moved for 450 years, was packed into wooden crates. The largest statues of saints, measuring around 13 meters in height, were shipped on barges to the Cathedral in Sandomierz, and the remaining pieces were stashed in secret hideaways, including the vault in the presbytery of St. Mary’s Basilica. However, after the Nazis seized Kraków they quickly located the altar and sent it off to Germany in the same year. Karol Estreicher refused to ever accept that. He would not rest until he brought the masterpiece back to Poland. Years later, Marta Grzywacz traced the footsteps of the charismatic researcher in the excellent book Obrońca Skarbów (editor’s translation: Treasure Defender), documenting the history of the artworks looted by the Nazis and the spectacular restitution missions carried out after World War II. It was Karol Estreicher who gave the Allies a nearly 600-page-long secret report on the looted monuments and contributed to the formation of an international elite group called the Monuments Men (whose work inspired the plot of a movie directed by George Clooney in 2014). After the war, Estreicher questioned German museum personnel and members of the Schutzstaffel (SS) who had looted the European museums, followed every lead and checked every piece of information that might bring him closer to his goal. He traveled to Germany and helped the Allies search warehouses, church basements, mines and former offices of the Nazi Party (NSDAP). One building after another, one house after another. With the help of the Americans, St. Mary’s Altar was found in the basement of the Nuremberg Castle. Stwosz’s Gothic artwork, somewhat damaged by humidity and insects, returned to Poland in 1946 in 107 crates in four railcars, accompanied by paintings by Canaletto and Leonardo da Vinci’s Lady with an Ermine, recovered from Hans Frank’s villa in Bayern. 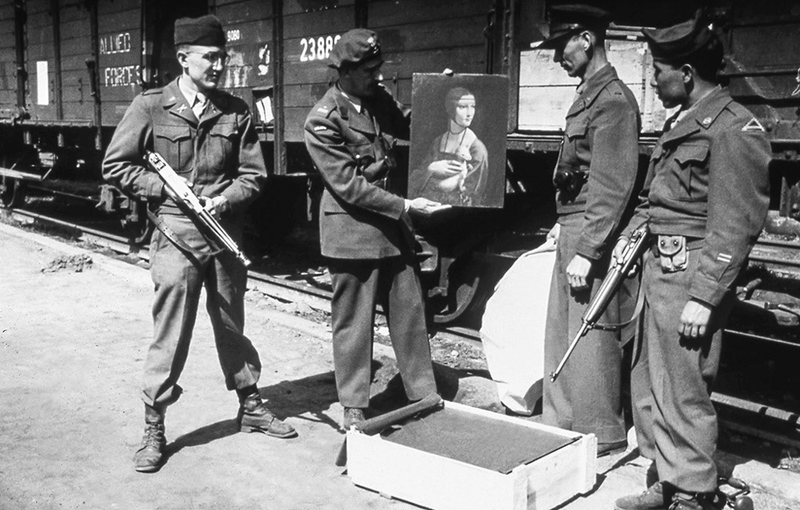 Escorted by American soldiers, the masterpiece was greeted at the train station in Kraków by cheering crowds. Just as Kraków had its Karol Estreicher, Warsaw had its Stanisław Lorentz. Before the war broke out, the director of the National Museum in Warsaw asked the Museum’s curators to draw up a list of the most important artworks in the collections, which needed to be saved in first order. For fear of bombings, those working in the museum’s basements built shelters, made crates and boxes, and covered them over with debris and boards that had been lying in the basements. Built less than two years earlier, the edifice in Warsaw sheltered not only its own collections but also exhibits from the Royal Castle in Kraków and works of art from private collections and churches. The treasures survived the bombings, but not the plundering. ‘During the war, the museum was a secret center for protecting cultural heritage’, Prof. Lorentz said on Polish Radio. In an attempt to save everything that could be, Lorentz questioned the authenticity of various artworks, changed exhibit numbers, and played for time by arguing that certain paintings needed to be scrutinized in detail. As a result of his efforts, the German authorities abandoned plans to destroy the Jan Kiliński Monument in 1942 and instead agreed for it to be deposited in the basement of the National Museum. After the fall of the Warsaw Uprising, Lorentz successfully negotiated with the occupying forces on the possibility of evacuating collections of special importance for Polish culture. He risked a lot to rescue elements of the interior decoration of the Royal Castle: pieces of boiserie, floors and fireplaces. Finally, he kept a detailed record of all the collections that were destroyed and plundered by the Germans throughout the war to facilitate their subsequent restitution and restoration. Stanisław Lorentz served as director of the National Museum in Warsaw for more than half a century. He was a lecturer at the University of Warsaw and a UNESCO expert on the protection of monuments. He was awarded the Commander’s Cross with Star of the Order of Polonia Restituta for rescuing cultural heritage. Several days before the war broke out, Józef Krzywda-Polkowski, an architect who would go down in history as the Wawel’s defense commander, prepared solid tubular cases and over 20 iron crates. They had to accommodate the coronation sword of the Polish kings, melee weapons, Fryderyk (Frédéric) Chopin’s manuscripts, old prints and above all King Sigismund II Augustus’s tapestries, the largest collection of textiles commissioned by the king from the workshops of the greatest craftsmen of 16th-century Europe. The Jagiellonian treasures could not fall into the hands of the occupying forces. Unfortunately, almost all escape routes from Kraków were cut off in the first days of war. Train stations and railroad tracks were bombed, trains were canceled. The only hope left was the Wisła River. Without a moment’s hesitation, the bargeman Franciszek Misia set off with the precious cargo and reached Sandomierz several days later. It was not a safe voyage: the water levels were very low after the hot summer, and the overburdened coal barge was repeatedly forced to hide from German planes among the reeds. Towed by the ship Paweł, the tapestries then sailed to Kazimierz Dolny. After that, they were transported to Zamość on a dozen-odd peasant wagons. Other stops on the valuable textiles’ route included Bucharest, Malta, France and England. King Sigismund II Augustus’s tapestries traveled through half of Europe to finally find refuge in Canada. Forced into exile, the treasures spent over 20 years in Ottawa. Szyszko-Bohusz showed the delegate a photograph from the catalogue of a Polish exhibition in Berlin organised shortly before the war. 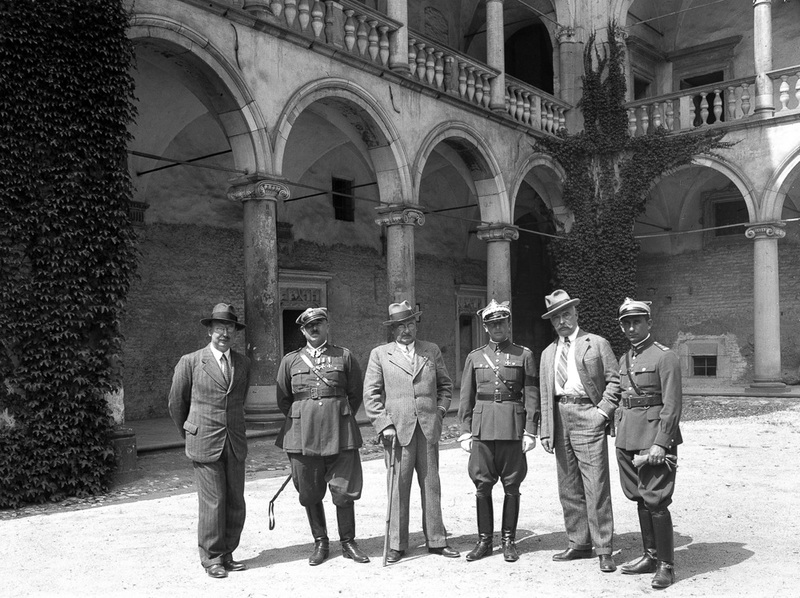 It captured Hitler being shown around by Ambassador Lipski in front of Dunikowski’s sculptures. In light of this fact, the permission was given to remove the sculptures from the castle in whole. However, Pelczarski’s sculptures and some of Szyszko-Bohusz’s models related to the concept of the Wawel Hill were destroyed. After the liberation, he was falsely accused of collaboration with the occupation regime. After being removed from working in the Wawel complex, he created a faculty of architecture in Kraków, then as part of the AGH University of Science and Technology. 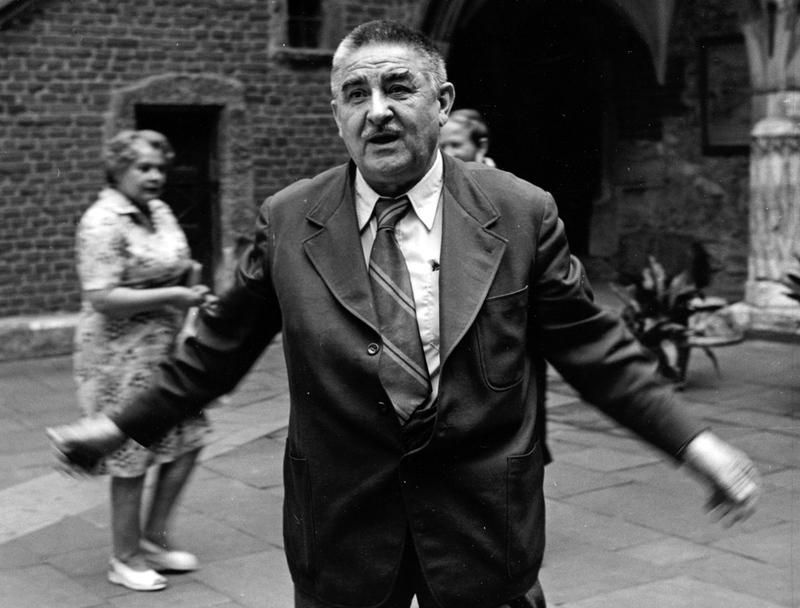 Prof. Jan Zachwatowicz in the Royal Castle during reconstruction, Warsaw, 1972, photo: Bolesław Miedza/PAP. It is afternoon. A truck drives up to the side gate. A befriended janitor lets it in. The car parks very close to the window of the basement where the documents are stored. The distance should be as short as possible. The poor-quality springs in the dilapidated truck bend dangerously under the weight of the crates, so the truck will need to make two trips. Gestapo officers are watching the operation, apparently convinced that the transport has been ordered by their chiefs, because they do not intervene. Zachwatowicz locks himself in the basement and waits for the truck to return. He experiences a moment of horror when someone overeagerly tries to get in. Luckily, they give up, and the operation ends in a success. That was when Estreicher’s name came up again: the inventory was placed in his custody in London. 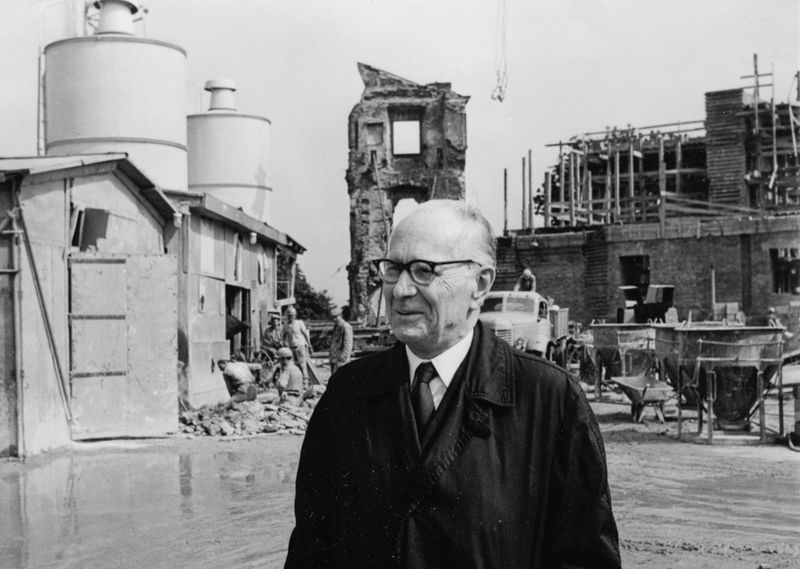 Prof. Zachwatowicz devoted the whole of his life to saving monuments and protecting cultural heritage. After the capitulation of the Warsaw Uprising, he took part in the Pruszków Operation – the evacuation of works of art that remained in the destroyed capital. Museum staff made efforts to save manuscripts by Henryk Sienkiewicz, Bolesław Prus, Maria Dąbrowska, and Jerzy Stempowski as well as the Saint Florian Psalter and Gallus Anonymus’s Chronicles. After the war, Jan Zachwatowicz authored the pioneering concept behind the reconstruction of Warsaw’s Old Town district. 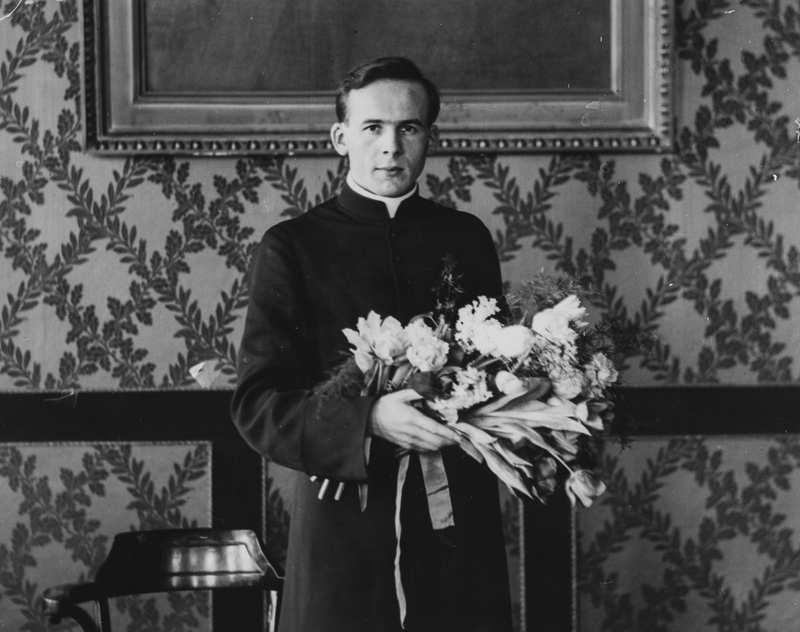 Priest Antoni Liedtke after the ceremony of conferring diplomas in theology at the University of Warsaw, 1931, photo: audiovis.nac.gov.pl (NAC). Priest Antoni Liedtke, a historian of Church and religious art, knew very well that the Gutenberg Bible, the most precious of the old prints in the Polish collections, could not remain in Pelplin any longer. He transported the book in a leather suitcase and deposited it in the vault of Bank Gospodarstwa Krajowego, from which the Bible reached Paris through Romania. And from there it traveled even further. That was when the hero of many war stories appeared again. One day before the German Army took control of the capital of France, Karol Estreicher transported the Bible on board a small ship called the Chorzów to England. 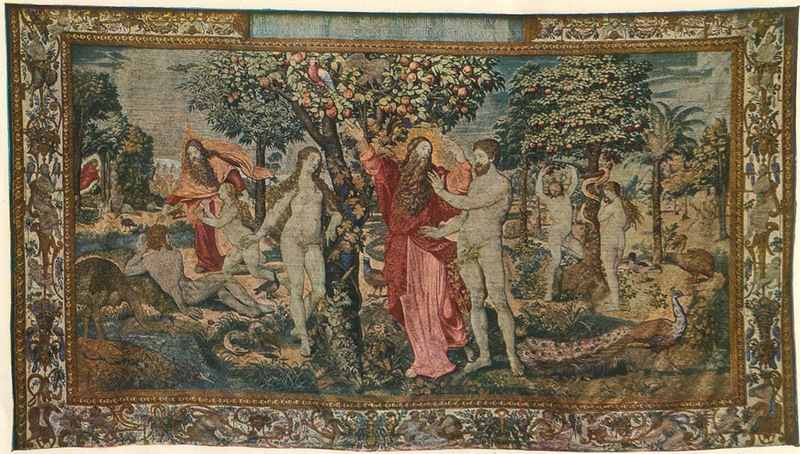 After a short stay in London, the Pelplin treasure and other artworks evacuated from Europe, including the Wawel tapestries, set off to Canada on board the famous ocean liner Batory, convoyed by two British warships. Estreicher was again one step ahead of the Nazis. The Gutenberg Bible returned home 20 years later, in 1959. It is stored in the safe of the Diocesan Museum in Pelplin. 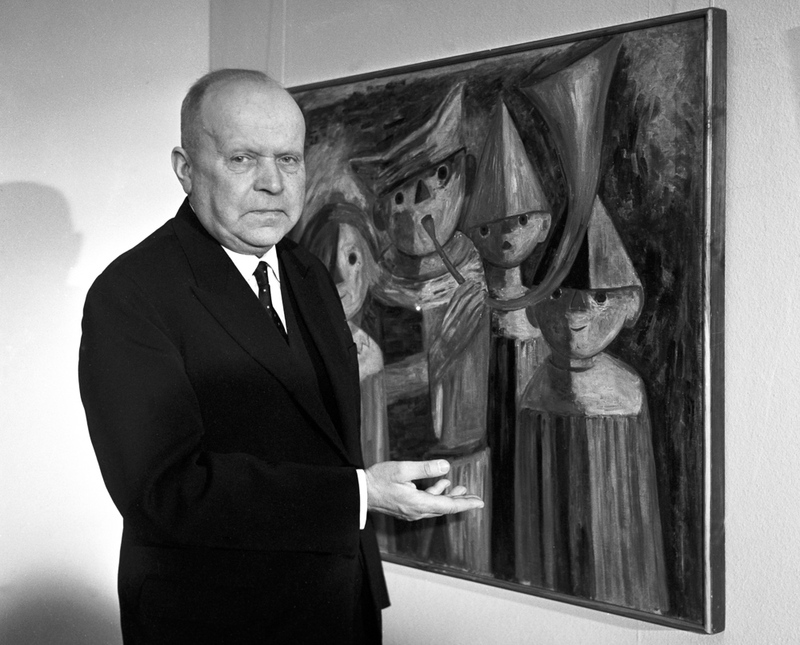 Stanisław Mikulicz-Radecki, director of the office of the Society for the Encouragement of the Fine Arts in Warsaw. 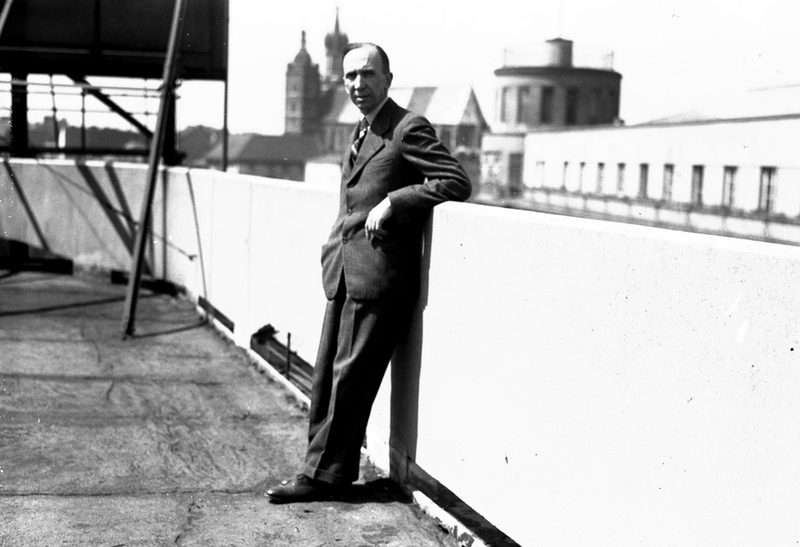 Situational photography on the rooftop of the Press Palace in Kraków, photograph from the period 1926-1933/ photo: audiovis.nac.gov.pl (NAC). For political reasons, The Battle of Grunwald was an especially valuable work of art for the Germans. Instructed by Goebbels himself, the authorities of the General Governorate, offered a reward for the disclosure of the whereabouts of Jan Matejko’s painting, initially setting the bounty at 2 million Reichsmarks and then raising it to 10 million. All to no avail. Workers dismantled the fence that separated the museum from neighboring estates, pretending they were repairing it. A carriage drove up. (…) In the afternoon, the huge cylinder was carried to the carriage, covered with some old pieces of household belongings to create the impression that someone was moving house, and the platform rode towards Tabory [municipal transportation authority]. The conspirators went on foot. No one asked them who they were, no one checked what they were transporting. The cylinder was transported to a barn. When the Red Army took control of Lublin in 1944, the painting was retrieved and officially handed over to the Ministry of Culture. After that, it underwent restoration under the guidance of Prof. Bohdan Marconi. Marconi himself also contributed vastly to the protection of monuments; during the war, he was involved in the operation of rescuing plafonds from the Royal Castle and kept a secret record of the collections of the National Museum. The State Studio for the Conservation of Cultural Property in the Central Office of Art Exhibitions (Zachęta National Art Gallery). 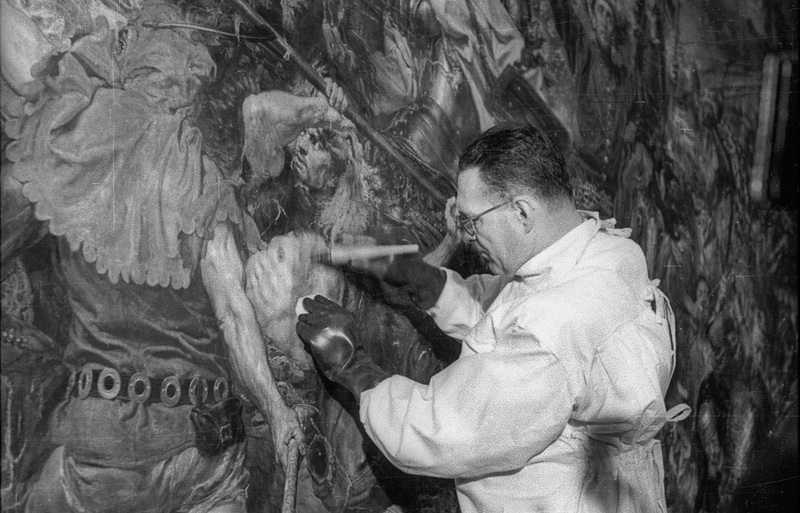 Conservation of Jan Matejko’s Battle of Grunwald, the photograph shows Bohdan Marconi. Warsaw, March 1949, photo: PAP. The Battle of Grunwald was handed over to the National Museum in Warsaw, where the painting remains on exhibition until the present day. That would have not been possible without the commitment of many people who saved Matejko’s paintings (Sermon of Piotr Skarga was another painting that was evacuated together with The Battle of Grunwald). They included not only art historians, museum personnel, and artists, like Stanisław Ejsmond (who died escorting the painting, when one of the Luftwaffe’s bombs struck the Lublin Museum) but also random passersby who spontaneously offered to help carry crates. State decorations were awarded to such individuals as Roman Pieczyrak, Henryk Krzesiński, Michał Grzesiak, Franciszek Podleśny and Władysław Woyda. The Knight’s Cross of the Order of Polonia Restituta was also awarded posthumously to Franciszek Galera, chief of the municipal transportation authority Tabory Miejskie who was ignored by the authorities of the Polish People’s Republic. Galera found and prepared the hideaway for The Battle of Grunwald and risked his life protecting the painting from the Nazis until the end. 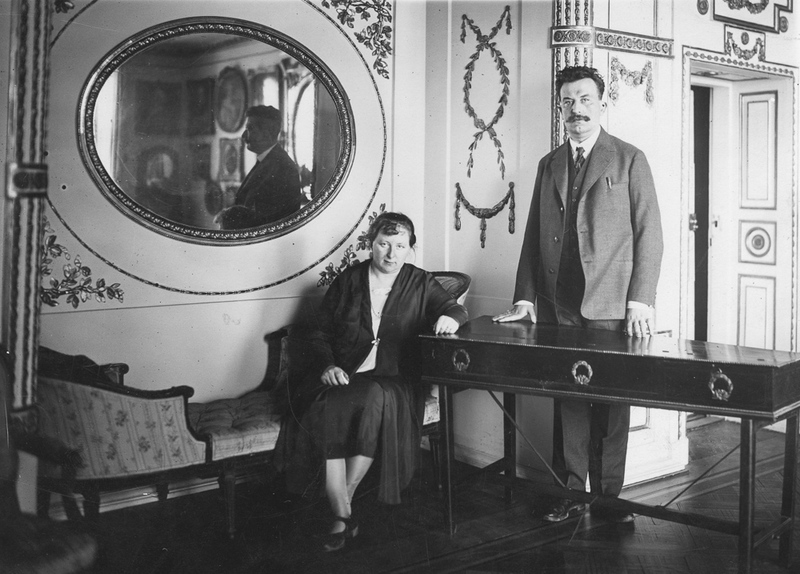 Maria Beata Branicka and Adam Branicki in one of the rooms of the Wilanów Palace, 1928, photo: audiovis.nac.gov.pl NAC. Thousands of drawings and paintings, silverware and porcelain, a collection of furniture and a huge library from the Museum of King Jan III’s Palace in Wilanów – all those items had to be secured and evacuated, preferably to the east. Maria Beata Branicka personally oversaw the packing, after ordering huge wooden crates. She had selected items from the collection walled up in the palace’s basements. Włodzimierz Kalicki reports that in order to mask the traces left by the removed paintings, the museum staff replaced them with other, less valuable works of art. The items selected to be transported away were kept in the living room. Back then, Bunia [Maria Beata Branicka – note by AL] managed to photograph some of them. Dressed in loose coats, Bunia and her sister, Elżbieta Dynowska (née Potocka), would walk past the items selected by the Germans and hide some of them in their pockets. That was how they saved the rose of Queen Marie Casimire, toys of the royal children, and items from the Chinese collections, among other things. They would take those items to the column room and hid them in the furnace. In the evening, when everyone had left, they would sneak into the column room and move those items to special hideaways located above the chapel and in the library. That was where the artworks spent the war. The last owners of the Wilanów Palace, Beata and Adam Branicki, were sent to Soviet forced labor camps and persecuted by the Security Office (UB) after their return to Poland under the communist regime They were posthumously awarded the Officer’s Crosses of the Order of Polonia Restituta. Sources: fragments of the books Obrońca skarbów: Karol Estreicher – w poszukiwaniu zagrabionych dzieł sztuki [Defender of Treasures: Karol Estreicher in Search of Looted Works of Art] by Marta Grzywacz (PWN) and Sztuka zagrabiona: Uprowadzenie Madonny [Looted Art: The Abduction of the Madonna] by Włodzimierz Kalicki and Monika Kuhnke (Agora); the remaining sources were: the Ministry of Culture and National Heritage, Sztuka i Krew [Art and Blood] by Robert Jarocki (PWN), Gazeta Krakowska, rp.pl, the Heidelberg University Library, the Toronto Public Library, culture.pl, Wikipedia.